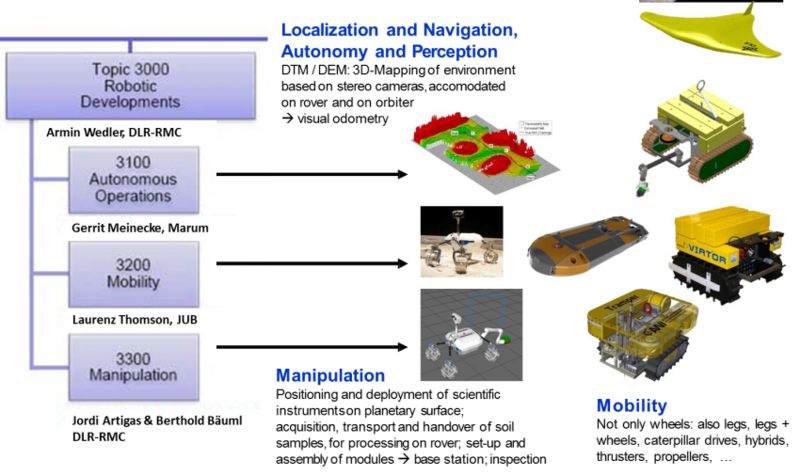 Exploration of deep sea and lunar environments requires un-manned mobile and manipulative systems that are able to be tele-operated or even operated in semi- or fully autonomous modes. By nature, deep-sea applications are much more advanced compared to space applications. However, a limited number of such systems are already operating quite successfully on Mars. In order to increase the science return from such systems, more sophistication in design is needed that goes beyond the present state-of-the-art. High mobility, precise and skilled manipulability and autonomous operations of the robotic systems at very remote sites are therefore important for successful exploration. In today´s world robotic systems already explore the deep sea as Remotely Operated Vehicles (ROVs), Autonomous Underwater Vehicles (AUVs), gliders and rovers/crawlers from ships, or even as components of a cabled observatory. For space applications, there are two major applications: First, the set-up of a robotic lunar base where robots will be used for building and operating the station. Thus, the station itself can be considered as a robotic system. Second, autonomous robots, like rovers and manipulators, are to be used to efficiently explore the lunar surface by transporting and deploying scientific instruments to different locations and to take surface samples and bring them back to a processing station like the lunar base. One specific example will be the set-up of an active seismic network on lunar surface that requires transportation and manipulation skills as well as enhanced autonomy functions. The science questions formulated in Topic 1000 determine the overall design concept of the station and the need for certain scientific instrumentations. The questions about the adequate location, constitution and tasks of the station then are being addressed and their functionalities developed in Topic 2000. Instruments as defined in Topic 4000 as well as operation units defined in Topic 2000 will be handled by the robots. The goals for deep sea robotic development are similar to those from lunar exploration: Deployment of scientific sensors, installation and maintenance of deep sea observation platforms, and spatial exploration. Topic 3000 comprises the work packages Autonomous Operations (WP 3100), Mobility (WP 3200) and Manipulation (WP 3300).